Transportation - Welcome to Our Generation USA! covers all modes of transport (passengers or freight), whether by land, air, or by sea, and including technological advancements in transportation means. ​Pictured: Left to right: The New York City Subway is the world's largest rapid transit system by length of routes and by number of stations (courtesy of AEMoreira042281 - Own work, CC BY-SA 3.0); A traffic jam on a typical American freeway, the Santa Monica Freeway in Los Angeles. (Courtesy of Coolcaesar at en.wikipedia - Transfered from en.wikipedia Transfer was stated to be made by User:Rschen7754. ); A Cargo Container Ship. Modes of transport include air, rail, road, water, cable, pipeline and space. The field can be divided into infrastructure, vehicles and operations. Transport is important because it enables trade between persons, which is essential for the development of civilizations. and terminals such as airports, railway stations, bus stations, warehouses, trucking terminals, refueling depots (including fueling docks and fuel stations) and seaports. Terminals may be used both for interchange of passengers and cargo and for maintenance. Operations deal with the way the vehicles are operated, and the procedures set for this purpose including financing, legalities and policies. In the transport industry, operations and ownership of infrastructure can be either public or private, depending on the country and mode. Passenger transport may be public, where operators provide scheduled services, or private. Freight transport has become focused on containerization, although bulk transport is used for large volumes of durable items. Transport plays an important part in economic growth and globalization, but most types cause air pollution and use large amounts of land. While it is heavily subsidized by governments, good planning of transport is essential to make traffic flow and restrain urban sprawl. "The traffic signals along Factoria Boulevard in Bellevue, Wash., generally don’t flash the same stretch of green twice in a row, especially at rush hour. At 9:30 a.m., the full red/yellow/green signal cycle might be 140 seconds. By 9:33 a.m, a burst of additional traffic might push it to 145 seconds. Less traffic at 9:37 a.m. could push it down to 135. Just like the traffic itself, the timing of the signals fluctuates. That’s by design. Bellevue, a fast-growing city of more than 130,000 just east of Seattle, utilizes a system that is gaining popularity around the U.S.: intersection signals that can adjust in real-time to traffic conditions. City officials say that these lights, known as adaptive signals, have led to significant declines in both the hassle and cost of commuting. As city leaders increasingly turn to data for insight into running their metros more efficiently, adaptive signals have emerged as a 21st century strategy to chip away at a longstanding scourge. According to the U.S. Census Bureau, almost 11 million Americans commute more than an hour each way to their job while 600,000 U.S. residents have one-way “megacommutes” of at least 90 minutes or 50 miles. And all that time on the roads costs money. The Center for Economics and Business Research estimates that U.S. commuters lost $124 billion in 2013 due to the cost of fuel, the value of time wasted in traffic, and the increased cost of doing business. CEBR predicts those costs will rise 50% by 2030. Smart traffic lights or Smart traffic signals are by the definition given by developers of a pilot project in Pittsburgh. "A new system that combines existing technology with artificial intelligence to create lights that truly think for themselves". Also known as intelligent traffic lights and advanced traffic lights this system differs to the traditional Traffic light system which are advanced signalling devices positioned at pedestrian crossings, road intersections and other places to control the flow of traffic. They are, in essence, signals that utilize a buried induction coil to sense the presence of signals that adapt to information that is received from a central computer about the position, speed and direction of vehicles. The pilot project in Pittsburgh may be the first step in their production across the United States of America. The technology for smart traffic signals has been developed by professors and students at Carnegie Mellon University and is being used in a pilot project in Pittsburgh in an effort to reduce vehicle emissions in the city. Unlike other dynamic control signals that adjust the timing and phasing of lights according to limits that are set in controller programming, this new system combines existing technology with artificial intelligence to create lights that truly think for themselves. The signals communicate with each other and adapt to changing traffic conditions to reduce the amount of time that cars spend idling. Using fiber optic video receivers similar to those already employed in dynamic control systems, the new technology monitors vehicle numbers and makes changes in real time to avoid congestion wherever possible. Initial results from the pilot study are encouraging: the amount of time that motorists spent idling at lights was reduced by 40% and travel times across the city were reduced by 26%. Companies involved in developing smart traffic management systems include BMW and Siemens, who unveiled their system of networked lights in 2010. This system works with the anti-idling technology that many cars are equipped with, to warn them of impending light changes. This should help cars that feature anti-idling systems to use them more intelligently, and the information that networks receive from the cars should help them to adjust light cycling times to make them more efficient. A major use of Smart traffic lights could be as part of public transport systems. The signals can be set up to sense the approach of buses or trams and change the signals in their favor, thus improving the speed and efficiency of sustainable transport modes. The main stumbling block to the widespread introduction of such systems is the fact that most vehicles on the road are unable to communicate with the computer systems that town and city authorities use to control traffic lights. However, the trial in Harris County, Texas, referred to above, uses a simple system based on signals received from drivers' cell phones and it has found that even if only a few drivers have their phone switched on, the system is still able to produce reliable data on traffic density. This means that the adoption of smart traffic lights around the world could be started as soon as a reasonable minority of vehicles were fitted with the technology to communicate with the computers that control the signals rather than having to wait until the majority of cars had such technology. Meanwhile, in the United Kingdom, lights that change to red when sensing that an approaching motorist is traveling too fast are being tracked in Swindon to see if they are more effective at reducing the number of accidents on the road than the speed cameras that preceded them and which were removed following a council decision in 2008. These lights are more focused on encouraging motorists to obey the law but if they prove to be a success then they could pave the way for more sophisticated systems to be introduced in the UK. ​Are "Driverless Cars" in your Future? Reports by "The Guardian"* and "Consumer Reports"** cite the risks as well as the rewards. YouTube Video: How Does Google's Driverless Car Work? Click here to read the report by Consumer Reports. ​A driverless car, (aka) self-driving car, robotic car) is a vehicle that is capable of sensing its environment and navigating without human input. Autonomous cars can detect surroundings using a variety of techniques such as radar, lidar, GPS, odometry, and computer vision. Advanced control systems interpret sensory information to identify appropriate navigation paths, as well as obstacles and relevant signage. Some demonstrative systems, precursory to autonomous cars, date back to the 1920s and 30s. The first self-sufficient (and therefore, truly autonomous) cars appeared in the 1980s, with Carnegie Mellon University's Navlab and ALV projects in 1984 and Mercedes-Benz and Bundeswehr University Munich's Eureka Prometheus Project in 1987. Since then, numerous major companies and research organizations have developed working prototype autonomous vehicles. all contributing to reduce car ownership. and risk of increased suburbanization as driving becomes faster and less onerous without proper public policies in place to avoid more urban sprawl. Autonomous means having the power for self-governance. Many historical projects related to vehicle autonomy have in fact only been automated (made to be automatic) due to a heavy reliance on artificial hints in their environment, such as magnetic strips. Autonomous control implies good performance under significant uncertainties in the environment for extended periods of time and the ability to compensate for system failures without external intervention. As can be seen from many projects mentioned, it is often suggested to extend the capabilities of an autonomous car by implementing communication networks both in the immediate vicinity (for collision avoidance) and far away (for congestion management). By bringing in these outside influences in the decision process, some would no longer regard the car's behavior or capabilities as autonomous; for example Wood et al. (2012) writes "This Article generally uses the term 'autonomous,' instead of the term 'automated.'" The term "autonomous" was chosen "because it is the term that is currently in more widespread use (and thus is more familiar to the general public). However, the latter term is arguably more accurate. 'Automated' connotes control or operation by a machine, while 'autonomous' connotes acting alone or independently. Most of the vehicle concepts (that we are currently aware of) have a person in the driver’s seat, utilize a communication connection to the Cloud or other vehicles, and do not independently select either destinations or routes for reaching them. Thus, the term 'automated' would more accurately describe these vehicle concepts". Pictured Below: (L-R) US HIGH SPEED RAIL ASSOCIATION: 21st Century Transportation for America; BNSF freight train rolls through the Rollins Pass in the Rocky Mountains with the rugged snow. U.S. railroads still play a major role in the nation's freight shipping. They carried 750 billion ton-miles by 1975 which doubled to 1.5 trillion ton-miles in 2005. In the 1950s, the U.S. and Europe moved roughly the same percentage of freight by rail; by 2000, the share of U.S. rail freight was 38% while in Europe only 8% of freight traveled by rail. In 2000, while U.S. trains moved 2,390 billion ton-kilometers of freight, the 15-nation European Union moved only 304 billion ton-kilometers of freight. In terms of ton-miles, railroads annually move more than 25% of the United States' freight and connect businesses with each other across the country and with markets overseas. Class I for freight railroads with annual operating revenues above $346.8 million in 2006 dollars. In 1900, there were 132 Class I railroads. Today, as the result of mergers, bankruptcies, and major changes in the regulatory definition of "Class I", there are only seven railroads operating in the United States that meet the criteria for Class I. 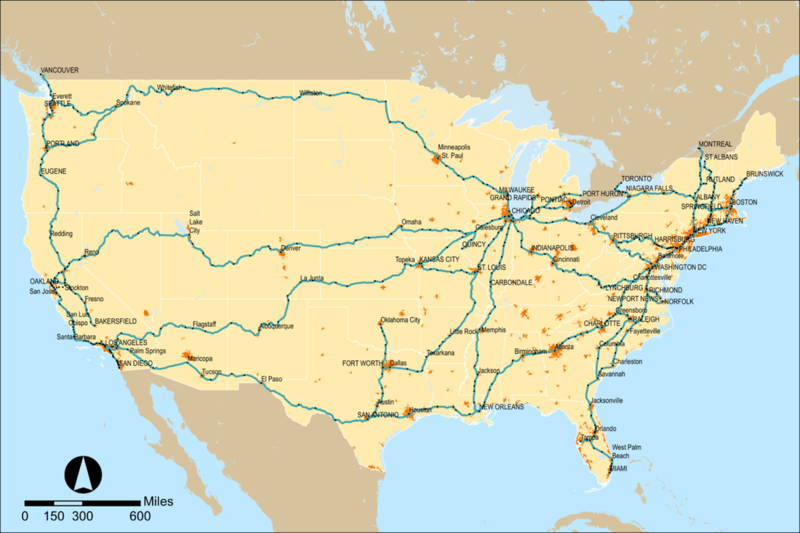 As of 2011, U.S. freight railroads operated 139,679 route-miles (224,792 km) of standard gauge in the U.S. Although Amtrak qualifies for Class I status under the revenue criteria, it is not considered a Class I railroad because it is not a freight railroad. U.S. freight railroads operate in a highly competitive marketplace. To compete effectively against each other and against other transportation providers, railroads must offer high-quality service at competitive rates. In 2011, within the U.S., railroads carried 39.9% of freight by ton-mile, followed by trucks (33.4%), oil pipelines (14.3%), barges (12%) and air (0.3%). However, railroads' revenue share has been slowly falling for decades, a reflection of the intensity of the competition they face and of the large rate reductions railroads have passed through to their customers over the years. North American railroads operated 1,471,736 freight cars and 31,875 locomotives, with 215,985 employees. They originated 39.53 million carloads (averaging 63 tons each) and generated $81.7 billion in freight revenue of present 2014. The average haul was 917 miles. The largest (Class 1) U.S. railroads carried 10.17 million intermodal containers and 1.72 million piggyback trailers. Intermodal traffic was 6.2% of tonnage originated and 12.6% of revenue. The largest commodities were coal, chemicals, farm products, nonmetallic minerals and intermodal. Other major commodities carried include lumber, automobiles, and waste materials. Coal alone was 43.3% of tonnage and 24.7% of revenue. Coal accounted for roughly half of U.S. electricity generation and was a major export. As natural gas became cheaper than coal, coal supplies dropped 11% in 2015 but coal rail freight dropped by up to 40%, allowing an increase in car transport by rail, some in tri-level railcars. The fastest growing rail traffic segment is currently intermodal. Intermodal is the movement of shipping containers or truck trailers by rail and at least one other mode of transportation, usually trucks or ocean-going vessels. Intermodal combines the door-to-door convenience of trucks with the long-haul economy of railroads. Rail intermodal has tripled in the last 25 years. It plays a critical role in making logistics far more efficient for retailers and others. The efficiency of intermodal provides the U.S. with a huge competitive advantage in the global economy. The sole intercity passenger railroad in the continental U.S. is Amtrak. Commuter rail systems exist in more than a dozen metropolitan areas, but these systems are not extensively interconnected, so commuter rail cannot be used alone to traverse the country. Commuter systems have been proposed in approximately two dozen other cities, but interplays between various local-government administrative bottlenecks and ripple effects from the 2007–2012 global financial crisis have generally pushed such projects farther and farther into the future, or have even sometimes mothballed them entirely. The most culturally notable and physically evident exception to the general lack of significant passenger rail transport in the U.S. is the Northeast Corridor between Washington, Baltimore, Philadelphia, New York City, and Boston, with significant branches in Connecticut and Massachusetts. The corridor handles frequent passenger service that is both Amtrak and commuter. New York City itself is noteworthy for high usage of passenger rail transport, both subway and commuter rail (Long Island Rail Road, Metro-North Railroad, New Jersey Transit). The subway system is used by one third of all U.S. mass transit users. Other major cities with substantial rail infrastructure include Boston's MBTA, Philadelphia's SEPTA, and Chicago's elevated system and commuter rail system Metra. The commuter rail systems of San Diego and Los Angeles, Coaster and Metrolink, connect in Oceanside, California. Privately run new inter-city passenger rail operations are under development. Brightline is a higher-speed rail train, run by All Aboard Florida. It began service in January 2018 between Fort Lauderdale and West Palm Beach, with eventual connections to Miami and Orlando. Iowa Pacific is seeking to operate Eastern Flyer, a passenger train between Oklahoma City and Tulsa. This would be the first passenger trains to serve Tulsa since 1967. Iowa Pacific operated test runs on the route in 2014. The basic design of a passenger car was standardized by 1870. By 1900 the main car types were: baggage, coach, combine, diner, dome car, lounge, observation, private, Pullman, railroad post office (RPO) and sleeper. ​The first passenger cars in the resembled stagecoaches. They were short, often less than 10 ft (3.05 m) long, tall and rode on a single pair of axles. One possible reason for this difference in design principles between American and European carbuilding practice could be the average distance between stations on the two continents. While most European railroads connected towns and villages that were still very closely spaced, American railroads had to travel over much greater distances to reach their destinations. Building passenger cars with a long passageway through the length of the car allowed the passengers easy access to the restroom, among other things, on longer journeys. With the 1930s came the widespread use of stainless steel for car bodies. The typical passenger car was now much lighter than its "heavyweight" wood cousins of old. The new "lightweight" and streamlined cars carried passengers in speed and comfort to an extent that had not been experienced to date. Aluminum and Cor-ten were also used in lightweight car construction, but stainless steel was the preferred material for car bodies. It is not the lightest of materials, nor is it the least expensive, but stainless steel cars could be, and often were, left unpainted except for the car's reporting markers that were required by law. By the end of the 1930s, railroads and carbuilders were debuting carbody and interior styles that could only be dreamed of before. In 1937, the Pullman Company delivered the first cars equipped with roomettes—that is, the car's interior was sectioned off into compartments, much like the coaches that were still in widespread use across Europe. Pullman's roomettes, however, were designed with the single traveler in mind. The roomette featured a large picture window, a privacy door, a single fold-away bed, a sink and small toilet. The roomette's floor space was barely larger than the space taken up by the bed, but it allowed the traveler to ride in luxury compared to the multilevel semiprivate berths of old. Now that passenger cars were lighter, they were able to carry heavier loads, but the size of the average passenger load that rode in them didn't increase to match the cars' new capacities. ​The average passenger car couldn't get any wider or longer due to side clearances along the railroad lines, but they generally could get taller because they were still shorter than many freight cars and locomotives. As a result, the railroads soon began building and buying dome and bilevel cars to carry more passengers. ​Carbody styles have generally remained consistent since the middle of the 20th century. While new car types have not made much of an impact, the existing car types have been further enhanced with new technology. While intercity passenger rail travel declined in the United States during the 1950s, ridership continued to increase in Europe during that time. With the increase came newer technology on existing and new equipment. The Spanish company Talgo began experimenting in the 1940s with technology that would enable the axles to steer into a curve, allowing the train to move around the curve at a higher speed. The steering axles evolved into mechanisms that would also tilt the passenger car as it entered a curve to counter the centrifugal force experienced by the train, further increasing speeds on existing track. Today, tilting passenger trains are commonplace. Talgo's trains are used on some short and medium distance routes such as Amtrak Cascades from Eugene, Oregon, to Vancouver, British Columbia. In August 2016, the Department of Transportation approved the largest loan in the department's history, $2.45 billion to upgrade the passenger train service in the Northeast region. The $2.45 billion will be used to purchase 28 new train sets for the high-speed Acela train between Washington through Philadelphia, New York and into Boston. The money will also be used build new stations and platforms. The money will also be used to rehabilitate railroad tracks and upgrade four stations, including Washington’s Union Station and Baltimore’s Penn Station. Every piece of railroad rolling stock operating in North American interchange service is required to carry a standardized set of reporting markings. The marks are made up of a two- to four-letter code identifying the owner of the equipment accompanied by an identification number and statistics on the equipment's capacity and tare (unloaded) weight. Marks whose codes end in X (such as TTGX) are used on equipment owned by entities that are not common carrier railroads themselves. 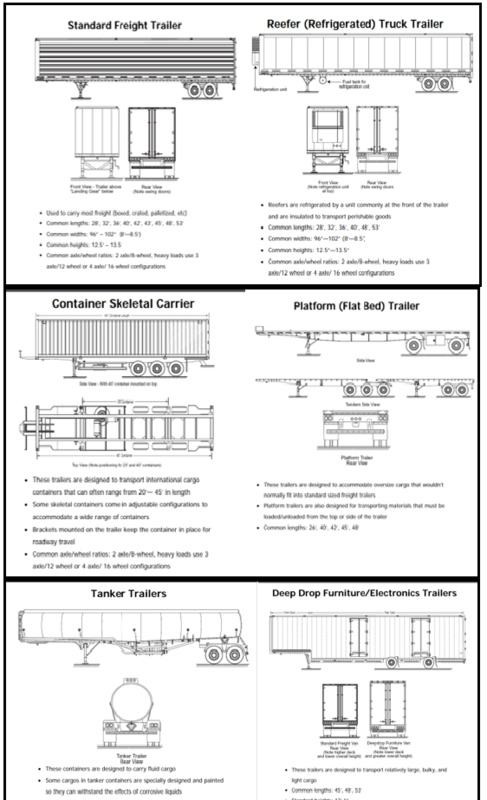 Marks whose codes end in U are used on containers that are carried in intermodal transport, and marks whose codes end in Z are used on trailers that are carried in inter-modal transport, per ISO standard 6346). Most freight cars carry automatic equipment identification RFID transponders. 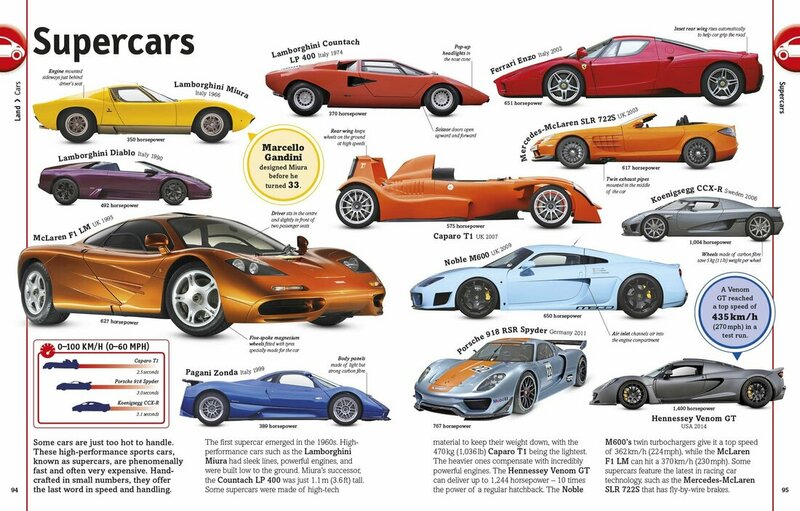 ​Pictured below: the Evolution of Autos over Time. The first earth tracks were created by humans carrying goods and often followed trails. Tracks would be naturally created at points of high traffic density. As animals were domesticated, horses, oxen and donkeys became an element in track-creation. With the growth of trade, tracks were often flattened or widened to accommodate animal traffic. Later, the travois, a frame used to drag loads, was developed. Animal-drawn wheeled vehicles were probably developed in the Ancient Near East in the 4th or 5th millennium BC and spread to Europe and India in the 4th millennium BC and China in about 1200 BC. The Romans had a significant need for good roads to extend and maintain their empire and developed Roman roads. In the Industrial Revolution, John Loudon McAdam (1756–1836) designed the first modern highways, using inexpensive paving material of soil and stone aggregate (macadam), and he embanked roads a few feet higher than the surrounding terrain to cause water to drain away from the surface. With the development of motor transport there was an increased need for hard-topped roads to reduce washaways, bogging and dust on both urban and rural roads, originally using cobblestones and wooden paving in major western cities and in the early 20th century tar-bound macadam (tarmac) and concrete paving were extended into the countryside. The history of rail transportation dates back nearly 500 years, and includes systems with man or horse power and rails of wood (or occasionally stone). This was usually for moving coal from the mine down to a river, from where it could continue by boat, with a flanged wheel running on a rail. The use of cast iron plates as rails began in the 1760s, and was followed by systems (plateways) where the flange was part of the rail. However, with the introduction of rolled wrought iron rails, these became obsolete. Modern rail transport systems first appeared in England in the 1820s. These systems, which made use of the steam locomotive, were the first practical form of mechanized land transport, and they remained the primary form of mechanized land transport for the next 100 years. The history of rail transport also includes the history of rapid transit and arguably monorail history. ​Pictured Below: ​Big set of sea ships. Water carriage and maritime transport in flat design style. Side view vector illustration. In the stone ages primitive boats developed to permit navigation of rivers and for fishing in rivers and off the coast. It has been argued that boats suitable for a significant sea crossing were necessary for people to reach Australia an estimated 40,000-45,000 years ago. With the development of civilization, vessels evolved for expansion and generally grew in size for trade and war. In the Mediterranean, galleys were developed about 3000 BC. Polynesian double-hulled sailing vessels with advanced rigging were used between 1,300 BC and 900 BC by the Polynesian progeny of the Lapita culture to expand 6,000 km across open ocean from the Bismarck Archipelago east to Micronesia and, eventually Hawaii. Galleys were eventually rendered obsolete by ocean-going sailing ships, such as the Arabic caravel in the 13th century, the Chinese treasure ship in the early 15th century, and the Mediterranean man-of-war in the late 15th century. In the Industrial Revolution, the first steamboats and later diesel-powered ships were developed. Eventually submarines were developed mainly for military purposes for people's general benefit. Meanwhile, specialized craft were developed for river and canal transport. Canals were developed in Mesopotamia c. 4000 BC. The Indus Valley Civilization in Pakistan and North India (from c. 2600 BC) had the first canal irrigation system in the world. The longest canal of ancient times was the Grand Canal of China. is 1,794 kilometers (1,115 mi) long and was built to carry the Emperor Yang Guang between Beijing and Hangzhou. The project began in 605, although the oldest sections of the canal may have existed since c. 486 BC. Canals were developed in the Middle Ages in Europe in Venice and the Netherlands. ​Pierre-Paul Riquet began to organize the construction of the 240 km-long Canal du Midi in France in 1665 and it was opened in 1681. In the Industrial Revolution, inland canals were built in England and later the United States before the development of railways. Specialized craft were also developed for fishing and later whaling. Ramps for water were made in 1459. Maritime history also deals with the development of navigation, oceanography, cartography and hydrography. Aviation started with the invention of Santos Dummont, Brazilian born scientist, who created the 14BIS and the very first motor powered airplanes in the world . Humanity's desire to fly likely dates to the first time man observed birds, an observation illustrated in the legendary stories of Daedalus and Icarus in Greek mythology, and the Vimanas in Indian mythology. Much of the focus of early research was on imitating birds, but through trial-and-error, balloons, airships, gliders and eventually powered aircraft and other types of flying machines were invented. Kites were the first form of man-made flying objects, and early records suggest that kites were around before 200 BC in China. Leonardo da Vinci's dream of flight found expression in several designs, but he did not attempt to demonstrate flight by literally constructing them. During the 17th and 18th century, when scientists began analyzing the Earth's atmosphere, gases such as hydrogen were discovered which in turn led to the invention of hydrogen balloons. ​Various theories in mechanics by physicists during the same period of time—notably fluid dynamics and Newton's laws of motion—led to the foundation of modern aerodynamics. Tethered balloons filled with hot air were used in the first half of the 19th century and saw considerable action in several mid-century wars, most notably the American Civil War, where balloons provided observation during the Siege of Petersburg. The realistic dream of spaceflight dated back to Konstantin Tsiolkovsky, however Tsiolkovsky wrote in Russian, and this was not widely influential outside Russia. Spaceflight became an engineering possibility with the work of Robert H. Goddard's publication in 1919 of his paper 'A Method of Reaching Extreme Altitudes'; where his application of the de Laval nozzle to liquid-propellant rockets gave sufficient power that interplanetary travel became possible. This paper was highly influential on Hermann Oberth and Wernher von Braun, later key players in spaceflight. The first human spaceflight was achieved with the Soviet space program's Vostok 1 mission in 1961. The lead architects behind the mission were Sergei Korolev and Kerim Kerimov, with Yuri Gagarin being the first astronaut. Kerimov later went on to launch the first space docks (Kosmos 186 and Kosmos 188) in 1967 and the first space stations (Salyut and Mir series) from 1971 to 1991. The first spaceflight to the Moon was achieved with NASA's Apollo 11 mission in 1969, with Neil Armstrong and Buzz Aldrin being the first astronauts on the Moon. The field can be divided into infrastructure, vehicles and operations. Transport is important because it enables trade between people, which is essential for the development of civilizations. ​Transport plays an important part in economic growth and globalization, but most types cause air pollution and use large amounts of land. While it is heavily subsidized by governments, good planning of transport is essential to make traffic flow and restrain urban sprawl. 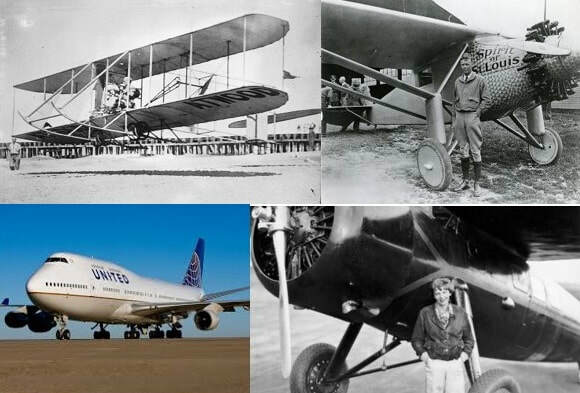 Click here for a list of Aviation Pioneers. Aircraft includes fixed-wing and rotary-wing types, morphable wings, wing-less lifting bodies, as well as lighter-than-air craft such as balloons and airships. Aviation began in the 18th century with the development of the hot air balloon, an apparatus capable of atmospheric displacement through buoyancy. Some of the most significant advancements in aviation technology came with the controlled gliding flying of Otto Lilienthal in 1896; then a large step in significance came with the construction of the first powered airplane by the Wright brothers in the early 1900s. 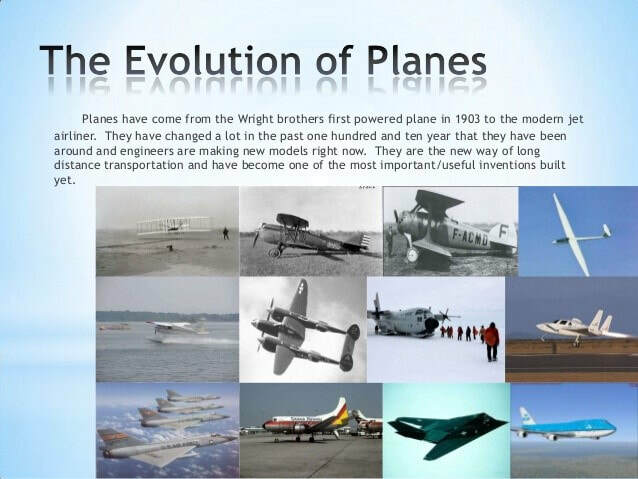 Since that time, aviation has been technologically revolutionized by the introduction of the jet which permitted a major form of transport throughout the world. YouTube Video: Which City Has the Most Crowded Commuter Trains? Commuter rail, also called suburban rail, is a passenger rail transport service that primarily operates between a city center and middle to outer suburbs beyond 15 km (10 miles) and commuter towns or other locations that draw large numbers of commuters—people who travel on a daily basis. Trains operate following a schedule at speeds varying from 50 to 225 km/h (30 to 140 mph). Distance charges or zone pricing may be used. Compared to rapid transit (or metro rail), commuter/suburban rail has lower frequency, following a schedule rather than fixed intervals, and fewer stations spaced further apart. They primarily serve lower density suburban areas (non inner-city), and often share right-of-way with intercity or freight trains. Some services operate only during peak hours and others uses fewer departures during off peak hours and weekends. Average speeds are high, often 50 km/h (30 mph) or higher. These higher speeds better serve the longer distances involved. Some services include express services which skip some stations in order to run faster and separate longer distance riders from short-distance ones. The general range of commuter trains' distance varies between 15 and 200 km (10 and 125 miles). Sometimes long distances can be explained by that the train runs between two or several cities (e.g. S-Bahn in the Ruhr area of Germany). Distances between stations may vary, but are usually much longer than those of urban rail systems. In city centers the train either has a terminal station or passes through the city center with notably fewer station stops than those of urban rail systems. Toilets are often available on-board trains and in stations. Most such trains run on the local standard gauge track. Some systems may run on a narrower or broader gauge. ​Some countries and regions, including Finland, India, Pakistan, Russia, Brazil and Sri Lanka, as well as San Francisco (BART) in the USA and Melbourne and Adelaide in Australia, use broad gauge track. However, the classification as a metro or rapid rail can be difficult as both may typically cover a metropolitan area exclusively, run on separate tracks in the centre, and often feature purpose-built rolling stock. ​Commuter rail trains are usually composed of multiple units, which are self-propelled, bidirectional, articulated passenger rail cars with driving motors on each (or every other) bogie. Depending on local circumstances and tradition they may be powered either by diesel engines located below the passenger compartment (diesel multiple units) or by electricity picked up from third rails or overhead lines (electric multiple units). Multiple units are almost invariably equipped with control cabs at both ends, which is why such units are so frequently used to provide commuter services, due to the associated short turn-around time. Locomotive hauled services are used in some countries or locations. This is often a case of asset sweating, by using a single large combined fleet for intercity and regional services. Loco hauled services are usually run in push-pull formation, that is, the train can run with the locomotive at the "front" or "rear" of the train (pushing or pulling). Trains are often equipped with a control cab at the other end of the train from the locomotive, allowing the train operator to operate the train from either end. The motive power for locomotive-hauled commuter trains may be either electric or Diesel-electric, although some countries, such as Germany and some of the former Soviet-bloc countries, also use diesel-hydraulic locomotives. In the USA and some other countries, a three-and-two seat plan is used. However, few people sit in the middle seat on these trains because they feel crowded and uncomfortable. Light rail is defined in the United States (and elsewhere) as a mode of electrified (or in a few exceptional cases, diesel-powered) rail-based transit, usually urban in nature, which is distinguished by operation in routes of generally exclusive, though not necessarily grade-separated, rights-of-way. This is distinguished from 'heavy rail' systems, also known as rapid transit or 'metro' (e.g. subway and/or elevated), which are fully grade-separated from other traffic, and which are characterized by higher passenger capacities than light rail. Arguably, traditional streetcars (also known as trolleys in North America, or as trams outside of North America especially in Europe), which is rail-based transit that takes place in shared roadways with automobile traffic (i.e. with street running) and thus does not operate in exclusive rights-of-way, can be considered to be a sub-set of light rail, though the two modes of transit are often treated as distinct in the United States. According to the American Public Transportation Association, of the 30-odd cities with light rail systems in the United States, the light rail systems in six of them (Boston, Los Angeles, Philadelphia, Portland (Oregon), San Diego, and San Francisco) achieve more than 30 million unlinked passenger transits per year. The United States has a number of light rail systems in its mid-sized to large cities. In the oldest legacy systems, such as in Boston, Cleveland, Newark, New Orleans, Philadelphia, Pittsburgh, and San Francisco, the light rail is vestigal from the first-generation streetcar systems of the 19th and early 20th centuries, but were spared the fate of other streetcar systems due to these systems having some grade separation from traffic and high ridership. A number of second-generation light rail systems were inaugurated in the 1980s starting with San Diego in 1981, with a few more built in the 1990s, and many more opened in lower density cities since the early 2000s. * -- Time lapse video shows the construction of the Maersk McKinney-Moller, which just concluded its maiden voyage to Busan. The Triple E Class cargo vessel was built at a Daewoo shipyard in Okpo, South Korea. ​Pictured below: Madrid Maersk. second largest cargo ship as of 2017. ​Click here for a List of the World's Largest Ships by Tonnage. A cargo ship or freighter ship is any sort of ship or vessel that carries cargo, goods, and materials from one port to another. Thousands of cargo carriers ply the world's seas and oceans each year, handling the bulk of international trade. 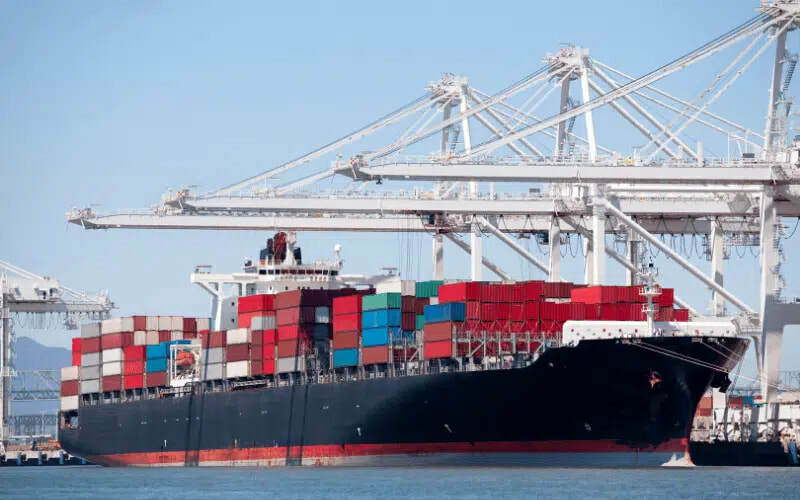 Cargo ships are usually specially designed for the task, often being equipped with cranes and other mechanisms to load and unload, and come in all sizes. Today, they are almost always built by welded steel, and with some exceptions generally have a life expectancy of 25 to 30 years before being scrapped. Specialized types of cargo vessels include container ships and bulk carriers (technically tankers of all sizes are cargo ships, although they are routinely thought of as a separate category). Cargo ships fall into two further categories that reflect the services they offer to industry: liner and tramp services. Those on a fixed published schedule and fixed tariff rates are cargo liners. Tramp ships do not have fixed schedules. Users charter them to haul loads. Generally, the smaller shipping companies and private individuals operate tramp ships. Cargo liners run on fixed schedules published by the shipping companies. Each trip a liner takes is called a voyage. Liners mostly carry general cargo. However, some cargo liners may carry passengers also. A cargo liner that carries 12 or more passengers is called a combination or passenger-run-cargo line. Today, about 90% of non-bulk cargo worldwide is transported by container ships, and the largest modern container ships can carry over 21,000 TEU (e.g., OOCL Hong Kong). Container ships now rival crude oil tankers and bulk carriers as the largest commercial seaborne vessels. 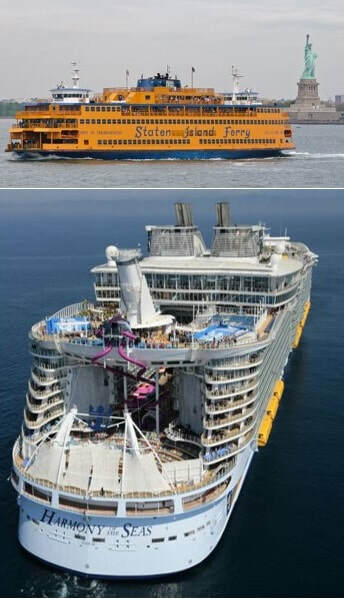 Click here for a List of the Largest Cruise Ships. A passenger ship is a merchant ship whose primary function is to carry passengers on the sea. The category does not include cargo vessels (see above) which have accommodations for limited numbers of passengers, such as the ubiquitous twelve-passenger freighters once common on the seas in which the transport of passengers is secondary to the carriage of freight. The type does however include many classes of ships designed to transport substantial numbers of passengers as well as freight. Indeed, until recently virtually all ocean liners were able to transport mail, package freight and express, and other cargo in addition to passenger luggage, and were equipped with cargo holds and derricks, kingposts, or other cargo-handling gear for that purpose. Only in more recent ocean liners and in virtually all cruise ships (below) has this cargo capacity been eliminated. and cruise ships (covered later herein), which often transport passengers on round-trips, in which the trip itself and the attractions of the ship and ports visited are the principal draw. An ocean liner is the traditional form of passenger ship. Once such liners operated on scheduled line voyages to all inhabited parts of the world. With the advent of airliners transporting passengers and specialized cargo vessels hauling freight, line voyages have almost died out. But with their decline came an increase in sea trips for pleasure and fun, and in the latter part of the 20th century ocean liners gave way to cruise ships as the predominant form of large passenger ship containing from hundreds to thousands of people, with the main area of activity changing from the North Atlantic Ocean to the Caribbean Sea. Although some ships have characteristics of both types, the design priorities of the two forms are different: ocean liners value speed and traditional luxury while cruise ships value amenities (swimming pools, theaters, ball rooms, casinos, sports facilities, etc.) rather than speed. These priorities produce different designs. In addition, ocean liners typically were built to cross the Atlantic Ocean between Europe and the United States or travel even further to South America or Asia while cruise ships typically serve shorter routes with more stops along coastlines or among various islands. For a long time, cruise ships were smaller than the old ocean liners had been, but in the 1980s, this changed when Knut Kloster, the director of Norwegian Caribbean Lines, bought one of the biggest surviving liners, the SS France, and transformed her into a huge cruise ship, which he renamed the SS Norway. Her success demonstrated that there was a market for large cruise ships. Successive classes of ever-larger ships were ordered, until the Cunard liner Queen Elizabeth was finally dethroned from her 56-year reign as the largest passenger ship ever built (a dethronement that led to numerous further dethronements from the same position). Both the RMS Queen Elizabeth 2 (QE2) (1969) and her successor as Cunard's flagship RMS Queen Mary 2 (QM2), which entered service in 2004, are of hybrid construction. Like transatlantic ocean liners, they are fast ships and strongly built to withstand the rigors of the North Atlantic in line voyage service, but both ships are also designed to operate as cruise ships, with the amenities expected in that trade. QM2 was superseded by the Freedom of the Seas of the Royal Caribbean line as the largest passenger ship ever built; however, QM2 still hold the record for the largest ocean liner. The Freedom of the Seas was superseded by the Oasis of the Seas in October 2009. ​A cruise ship is a passenger ship used for pleasure voyages, when the voyage itself, the ship's amenities, and sometimes the different destinations along the way (i.e., ports of call), are part of the experience. Transportation is not the only purpose of cruising, particularly on cruises that return passengers to their originating port (known as "closed-loop cruises"). On "cruises to nowhere" or "nowhere voyages", the ship makes 2–3 night round trips without any ports of call. In contrast, dedicated transport oriented ocean liners did "line voyages" and typically transport passengers from one point to another, rather than on round trips. Traditionally, a liner for the transoceanic trade will be built to a higher standard than a typical cruise ship, including higher freeboard and stronger plating to withstand rough seas and adverse conditions encountered in the open ocean, such as the North Atlantic. Ocean liners also usually have larger capacities for fuel, food, and other stores for consumption on long voyages, compared to dedicated cruise ships, but few are still in existence, such as the preserved liners and Queen Mary 2, which makes scheduled North Atlantic voyages. Although often luxurious, ocean liners characteristics that made them unsuitable for cruising, such as high fuel consumption, deep draughts that prevented their entering shallow ports, enclosed weatherproof decks that were not appropriate for tropical weather, and cabins designed to maximize passenger numbers rather than comfort (such as a high proportion of windowless suites). The gradual evolution of passenger ship design from ocean liners to cruise ships has seen passenger cabins shifted from inside the hull to the superstructure with private verandas. The modern cruise ships, while sacrificing some qualities of seaworthiness, have added amenities to cater to water tourists, and recent vessels have been described as "balcony-laden floating condominiums". ​The distinction between ocean liners and cruise ships has blurred, particularly with respect to deployment, although differences in construction remain. Larger cruise ships have also engaged in longer trips, such as transoceanic voyages which may not return to the same port for months (longer round trips). Some former ocean liners operate as cruise ships, such as Marco Polo, although this number is diminishing. The only dedicated transatlantic ocean liner in operation as a liner of December 2013 is Queen Mary 2 of the Cunard Line. She also has the amenities of contemporary cruise ships and sees significant service on cruises. ​As of 2017, the world's largest cruise ship was Royal Caribbean International's Symphony of the Seas. 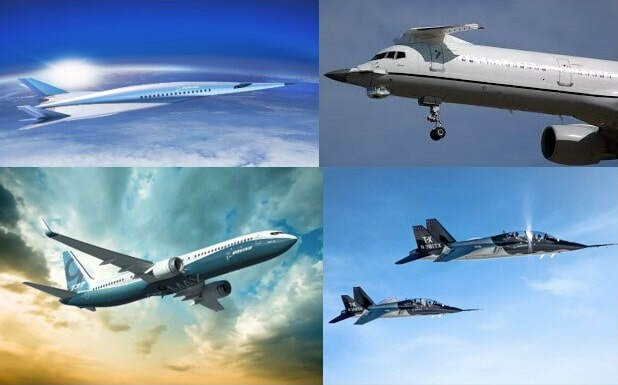 An aerospace manufacturer is a company or individual involved in the various aspects of designing, building, testing, selling, and maintaining aircraft, aircraft parts, missiles, rockets, or spacecraft. ​In 2015 the Aircraft Production was worth $180.3 Billion: 61% airliners, 14% business and general aviation, 12% Military aircraft, 10% military rotary wing and 3% civil rotary wing; while their MRO was worth $135.1 Bn or $315.4 Bn combined. The global aerospace industry was worth $838 billion in 2017: Aircraft & Engine OEMs represented 28% ($235 Bn), Civil & Military MRO & Upgrades 27% ($226 Bn), Aircraft Systems & Component Manufacturing 26% ($218 Bn), Satellites & Space 7% ($59 Bn), Missiles & UAVs 5% ($42 Bn) and other activity, including flight simulators, defense electronics, public research accounted for 7% ($59 Bn). The countries with the largest industry were led by the United States with $408.4 Bn (49%) followed by France with $69 Bn (8.2%) then China with $61.2 Bn (7.3%), United Kingdom with $48.8 Bn (5.8%), Germany with $46.2 Bn (5.5%), Russia with $27.1 Bn (3.2%), Canada with $24 Bn (2.9%) and Japan with $21 Bn (2.5%). The trucking industry serves the American economy by transporting large quantities of raw materials, works in process, and finished goods over land—typically from manufacturing plants to retail distribution centers. Trucks are also used in the construction industry, as dump trucks and portable concrete mixers move the large amounts of rocks, dirt, concrete, and other building materials used in construction. Trucks in America are responsible for the majority of freight movement over land and are tools in the manufacturing, transportation, and warehousing industries. Driving large trucks and buses require a commercial driver's license (CDL) to operate. Obtaining a CDL requires extra education and training dealing with the special knowledge requirements and handling characteristics of such a large vehicle. Drivers of commercial motor vehicles (CMVs) must adhere to the hours of service, which are regulations governing the driving hours of commercial drivers. These and all other rules regarding the safety of interstate commercial driving are issued by the Federal Motor Carrier Safety Administration (FMCSA). The FMCSA is a division of the United States Department of Transportation (USDOT), which governs all transportation-related industries such as trucking, shipping, railroads, and airlines. Some other issues are handled by another branch of the USDOT, the Federal Highway Administration (FHWA). ​Developments in technology, such as computers, satellite communication, and the Internet, have contributed to many improvements within the industry. These developments have increased the productivity of company operations, saved the time and effort of drivers, and provided new, more accessible forms of entertainment to men and women who often spend long periods of time away from home. In 2006, the United States Environmental Protection Agency implemented revised emission standards for diesel trucks (reducing airborne pollutants emitted by diesel engines) which promises to improve air quality and public health. In 1870 Siegfried Marcus built the first gasoline powered combustion engine, which he placed on a pushcart, building four progressively more sophisticated combustion-engine cars over a 10-to-15-year span that influenced later cars. Marcus created the two-cycle combustion engine. The car's second incarnation in 1880 introduced a four-cycle, gasoline-powered engine, an ingenious carburetor design and magneto ignition. He created an additional two models further refining his design with steering, a clutch and a brake. The four-stroke petrol (gasoline) internal combustion engine that still constitutes the most prevalent form of modern automotive propulsion was patented by Nikolaus Otto. The similar four-stroke diesel engine was invented by Rudolf Diesel. The hydrogen fuel cell, one of the technologies hailed as a replacement for gasoline as an energy source for cars, was discovered in principle by Christian Friedrich Schönbein in 1838. The battery electric car owes its beginnings to Ányos Jedlik, one of the inventors of the electric motor, and Gaston Planté, who invented the lead–acid battery in 1859. In 1885, Karl Benz developed a petrol or gasoline powered automobile. This is also considered to be the first "production" vehicle as Benz made several other identical copies. The automobile was powered by a single cylinder four-stroke engine. University of Washington Libraries Digital Collections – Transportation photographs Digital collection depicting various modes of transportation (including automobiles) in the Pacific Northwest region and western United States during the first half of the 20th century. Automotive History – An ongoing photographic history of the automobile. YouTube Video: How Does Safe Drive System's Collision Avoidance System Work? Pictured below: (a) A collision avoidance system. 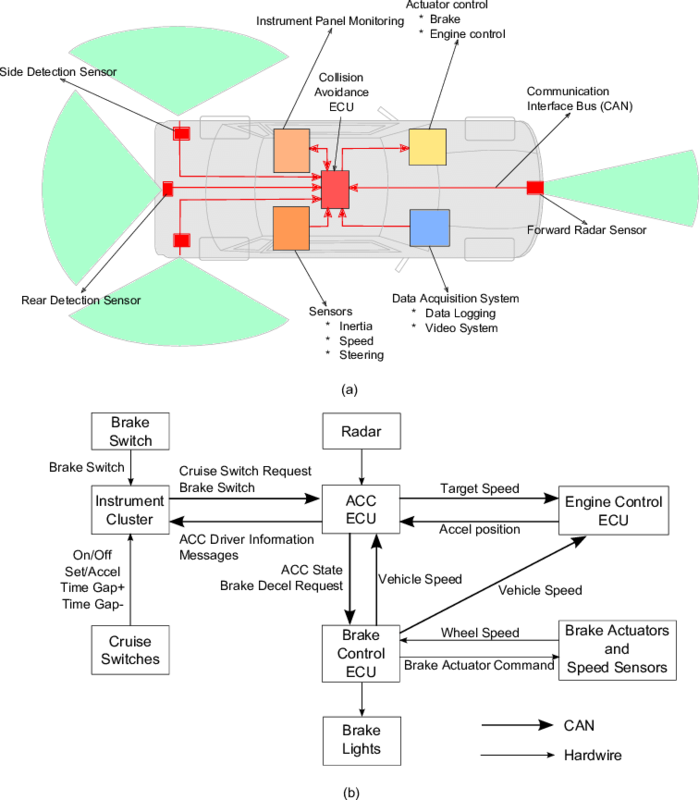 (b) An Automatic Cruise Control showing sensors and actuators. A collision avoidance system, also known as a precrash system, forward collision warning system, or collision mitigating system, is an automobile safety system designed to prevent or reduce the severity of a collision. It uses radar (all-weather) and sometimes laser (LIDAR) and camera (employing image recognition) to detect an imminent crash. GPS sensors can detect fixed dangers such as approaching stop signs through a location database. Once an impending collision is detected, these systems provide a warning to the driver. When the collision becomes imminent, they take action autonomously without any driver input (by braking or steering or both). Collision avoidance by braking is appropriate at low vehicle speeds (e.g. below 50 km/h (31 mph)), while collision avoidance by steering may be more appropriate at higher vehicle speeds if lanes are clear. Cars with collision avoidance may also be equipped with adaptive cruise control, using the same forward-looking sensors. In March 2016, the National Highway Traffic Safety Administration (NHTSA) and the Insurance Institute for Highway Safety announced the manufacturers of 99% of U.S. automobiles had agreed to include automatic emergency braking systems as standard on virtually all new cars sold in the U.S. by 2022. In Europe, there was a related agreement about advanced emergency braking system (AEBS) or autonomous emergency braking (AEB) in 2012. United Nations Economic Commission for Europe (UNECE) has announced that this kind of system will become mandatory for new heavy vehicles starting in 2015. NHTSA projected that the ensuing accelerated rollout of automatic emergency braking would prevent an estimated 28,000 collisions and 12,000 injuries. In India, Autonomous Emergency Braking system (AEB) could become mandatory on new cars by 2022. Ratings of existing crash avoidance systems, Insurance Institute for Highway Safety, January 2017. Argenia Railway Technologies (2005). Collision Avoidance Systems for The Railways (2005). From "Jimmy Kimmel Live": YouTube Video of Jimmy Kimmel as"The Uber Driver"
Click here for a List of Transportation Companies by Country. A transportation network company (TNC) connects paying passengers with drivers who provide the transportation on their own non-commercial vehicles. The concept was introduced in 2011 by Jahan Khanna and Sunil Paul, who would go on to become co-founders of Sidecar. In 2013 California Public Utilities Commission defined for regulation that a transportation network company is a company that uses an online-enabled platform to connect passengers with drivers using their personal, non-commercial, vehicles. An early definition of a TNC was created by the California Public Utilities Commission in 2013, as a result of a rule-making process around new and previously unregulated forms of transportation. Prior to the definition, the commission had attempted to group TNC services in the same category as limousines. Taxi industry groups opposed the creation of the new category, arguing that TNCs, as illegal taxicab operations are taking away their business. The commission established regulations for TNC services at the same time as the definition. These included driver background checks, driver training, drug and alcohol policies, minimum insurance coverage of $1 million, and company licensing through the Public Utilities Commission. Several communities, governments, organizations, and other persons consider Transportation Network Companies to be illegal and unauthorized transportation. TNCs are legally defined as technology companies and not transportation companies. TNCs have been banned in many places. Transportation network companies develop a computing platform which creates an online marketplace in which a driver and car owner registered with the company may offer their own labor and car to people who request a ride in the marketplace. The services offered by such companies include the maintenance of the marketplace where fare-paying customers can meet drivers for hire, vetting of drivers to ensure that they meet the standards of the company's own marketplace, and delivery of payment from customer to driver in their own financial transaction. The services of transportation network companies can be in demand because of the convenience of requesting a ride by a mobile app, the satisfaction of being able to have experience monitored by the company as a third party, and because of competitive pricing for services. Taxicabs can provide similar services, but while most cities require companies which provide taxicabs to meet requirements for business, transportation network companies may be exempt from such requirements due to their only providing a marketplace and not actually employing drivers or keeping automobiles. Another variation on the business model occurs when companies use similar online marketplaces to provide drivers who drive the customer's personal vehicle for them. Examples include Dryver, IDriveYourCar.com, and WeDrive. In these models, customers typically reserve a driver who arrives at their location, takes them wherever they need to go in the customer's own car, and then returns the car and the customer home at the end of the reservation.